Being on vacation and having a dead battery is a big problem. Nothing is worse than storing a jump starter in your car in case of an emergency and then finding out it’s out of power when you really need it. The new PEAK Portable Power Systems prevent this unfortunate situation with our innovative Low Charge Alert. When the system begins to run dangerously low, it will emit a low-frequency beep to let the user know it needs to be recharged. It’s really a great feature, so you don’t have to worry about being stranded. 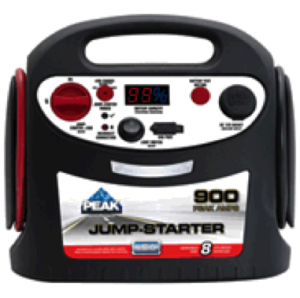 Peak® Portable 450-Amp Jump Start/Power Supply is absolutely essential when you’re on the go…and you won’t let anything stop you! You’ve got a starter to jump your weak battery, outlets to power your cell phone and a compressor to fix a flat. A built-in work light makes nighttime emergency repairs a lot easier. Voltmeter indicates battery charge level. For under $80 this is a great investment!